The stereotypical view of scientists is white lab coats, safety goggles and working in laboratories that have a clinical feel. However, science on a research ship is, in reality, very different. Hardhats, waterproofs, steel toe-capped boots and old clothes are just as important as lab coats and safety goggles. The first challenge for a scientist before the ship sails is to construct their lab and lash any equipment down to prevent anything moving as the ship rolls. Ratchet straps, cable ties, bungee cords, string and duct tape are a scientist’s best friend during this process. 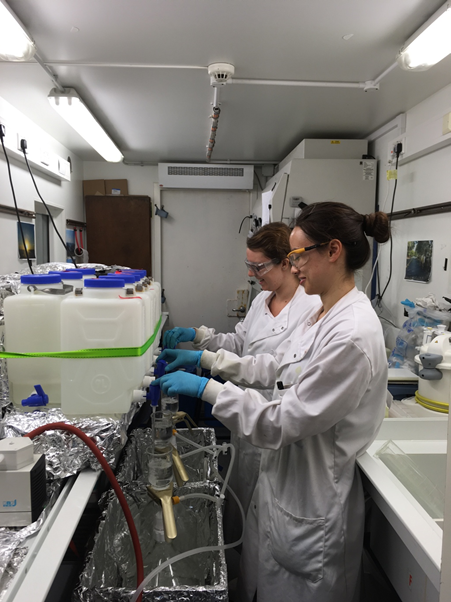 A further challenge arises as often oceanography pushes the boundaries of what has previously been measured and new methods are always being developed, which means getting creative in terms of lab equipment – not everything can be bought from a catalogue! Oceanographic equipment is often designed by the scientist who thought up the new method or instrument. 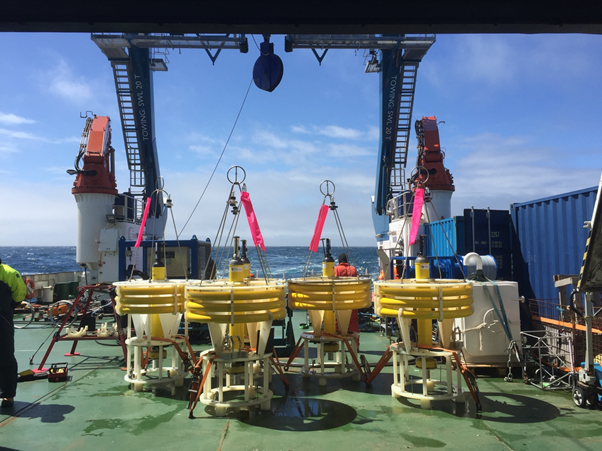 This can range from designing equipment to be deployed from scratch, for example PELAGRAs and Marine Snow Catchers, both designed at NOC, or using everyday items such as boxes, trays, tubing, polystyrene etc. to construct a fit for purpose rig to hold your equipment. An example of this is the chiller set up constructed by Rachel and I which we use to regulate incubations at 11 °C, and a filtering rig for collecting dissolved organic matter, which looks like a contraption from a bad sci-fi movie, but the tin foil actually prevents contamination. Research cruises constantly provide new challenges to be overcome and requires us to be resourceful with what we have on board. The DIY behind science at sea is just one of the many things that keeps our job interesting and our problem-solving skills sharp!